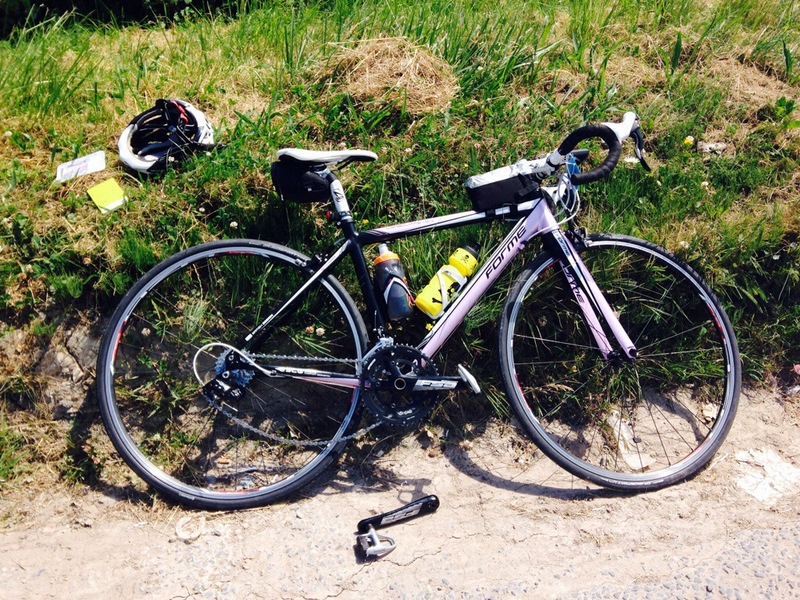 63 miles into 67 miles of the Dartmoor Classic and I’m sat on the roadside in the sunshine. I’ve just called HQ to ask for collection as my pedal and crank had come clean off. A volunteer marshal arrived had a look at the discarded crank on the floor and the bottom bracket and with my multi tool tried to reattach the crank to the bottom bracket. The reunion of metal parts wasn’t happening on the roadside so my bike and myself were loaded into a chilled estate car – best broom wagon I’ve seen, thank you driver Steve. The weekend had started off great, arriving at Newton Abbott race course registration on Saturday was swift and informative. A woman approached me outside asking if I’d like some free tyres – yes please, she didn’t have her bike with her so couldn’t take up the prize. Thank you, £65 worth of tyre & tubes covered my entry and hotel costs. 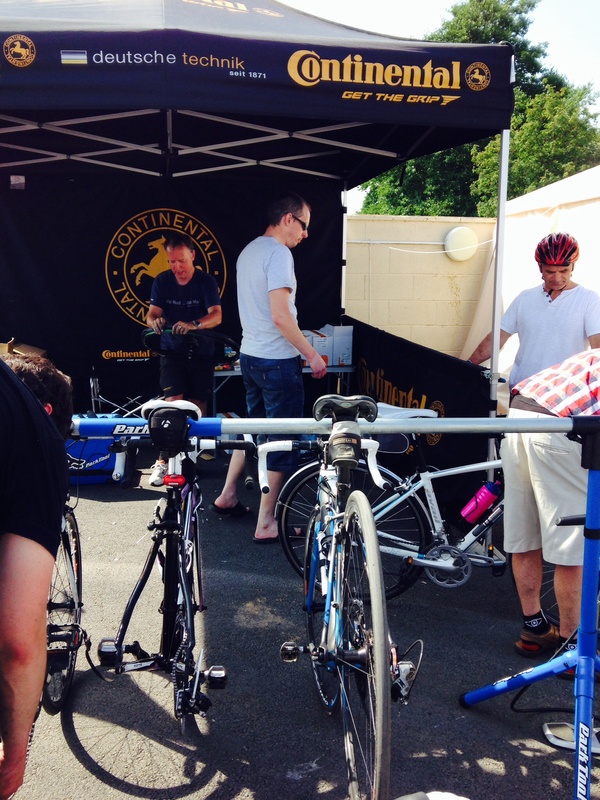 I dropped my bike off at the stand and got a free pair of fitted Continental Race tyres – lucky me. A well presented expo village with a variety of stands offering samples, spare parts and advise. I met up with a number of other Chippenham Wheelers for iced drinks. Most of us were staying in Torquay so arranged to meet for dinner. Finding my hotel on the seafront was easy, looking a little like Faulty Towers from the outside with seagulls sitting on the turrets and crumbling brick work. Whilst the hotel was clean it was in need of renovation. 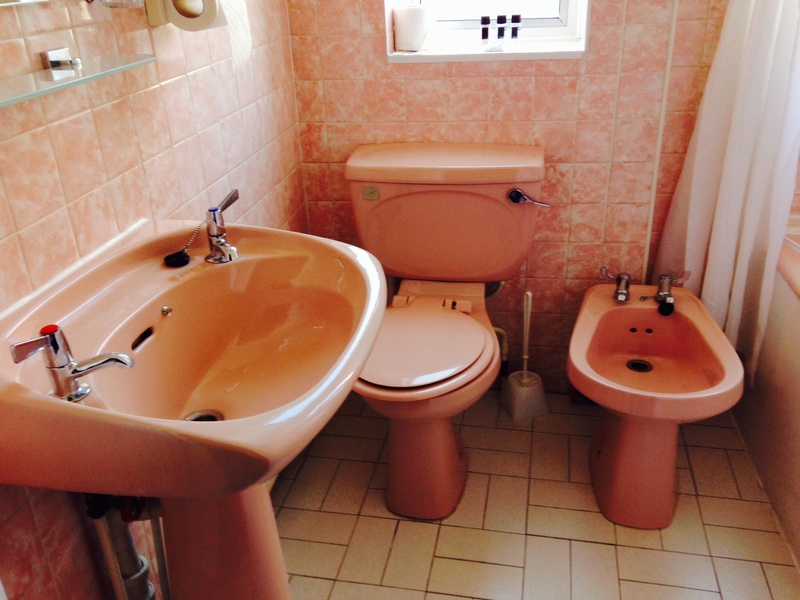 My bedroom was the pink princess room, the bathroom especially was like walking into a strawberry soufflé. Dodging stag & hen parties we found a table in Pizza Express, where we settled down and unexpectantly we were still there two and a half hours later. Needless to say the service was rubbish, food was ok and what we needed – pasta & pizza. At least they dropped the cost of all drinks, starters & sides so we only paid for our mains and one beer – bargain. 6am alarm after warm noisy night in my pink cave and I headed back to the race course. Met up with Luice & Steve but didn’t see any of the others although a few were on the Grande and a 7am start. We were on the Medio and 8am start. Bananas , flapjack & sunscreen being freely offered to all by marshals. The sun was shining, no wind, blue skies this was looking to be the best weather for a sportive I’ve had. Coffee & last toilet stop then ready to roll. Hoping my free tyres will give me some extra free speed we joined the third pen as the others were filled. Then at 8am the start horn went and our pen was completely taken by surprise as we were first to start ! 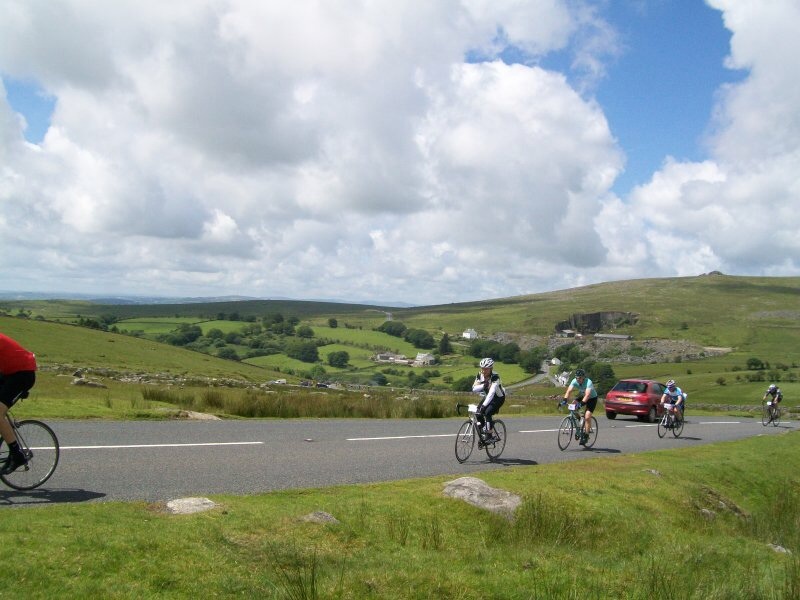 I managed 63 miles with 6200ft of climbing up and down and across Dartmoor. 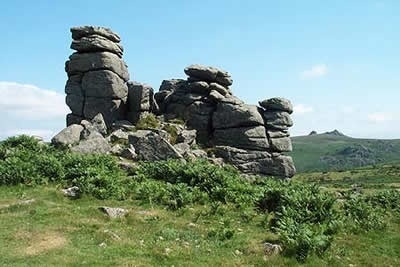 What fantastic views, we saw wild horses, cattle, sheep, huge Tors, stone walls made by stones the size of pillows. The hills were relentless some short and sharpe many sweeping across the moors stretched out miles ahead of up. What goes up must come down, unfortunately we couldn’t capitalise in the descents as many had switchbacks, gravel or sharpe bends. There were many obstacles to bring hundreds of cyclists to a halt. Tractors & hay trailers filling the lanes width saw us pressed against the hedges as it inched down past us. More 4×4 cars, horse boxes and horses to work our way around plus a few traffic lights at roadworks. The only blip on the road was a newly gravelled section which had lots of small grey gravel chips across the road, some puddling, some as a drift on the edges. This gave a very loose surface which was a nightmare when we reached a hill and sign indicating 20% incline ! up the hill on our cleats. The feed station was amazing, better than some pub Sunday lunches I’ve been to ! Plenty of cakes, flapjack, crisps and some local pies and quiches. Plenty of Torg gels so I chose apple crumble flavour as it was Sunday lunch. Lucie was suffering badly from a migraine so sensibly in the heat and hills took the bus back. I headed off for the second half of the ride which had few steep challenging hills but more sweeping and rolling. I really did like this ride for the scenery, organisation, location and friendly atmosphere in the race village pre & post race. Whilst I didn’t make the full Medio distance this year I rode the toughest part and only had to get off and push twice, once after the gravel hill topple the other just too steep for my legs after 70.3 last weekend. I was pleased my legs stood upto the testing route and hills, the heat didn’t really bother me as we had some shade or a breeze when moving. I had plenty to drink and got my fuelling intake right. A good strength training day in the saddle and I’ll definitely be back next year assuming I get in to complete the miles. I only got confirmation two weeks ago that I had a place from the reserve list as this one sells out really fast online. With nearly 4,000 riders it was the biggest group of riders I’ve been in and so plenty of company and little risk of getting lost. The marshals did a great job with traffic and used their flags to best effect. The organisers, marshals, volunteers all deserve a big thank you and special mention to my roadside collection. When I got back to the finish the organisers were lovely as I walked in with crank and pedal in hand and was directed to go through the timing beam and I could still have my goodie bag, T-shirt and I got an unclassified souvenir medal. Bike booked into repair shop, the hills, heat and cattle grids beat it up today. At least I get to ride another day. Great write up Zoe. 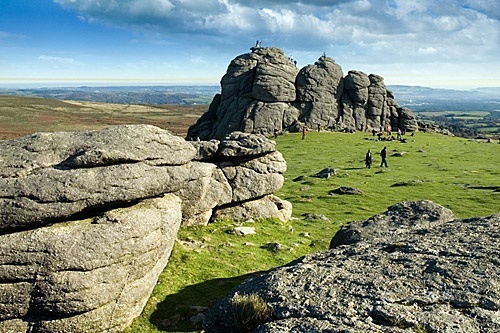 Count your blessing, if your crank was ready to break, better it happened on Dartmoor than at Bolton! And you did most of the miles – so training pretty goal much accomplished.